Athena outlets sprang up in most large towns and cities, and for a couple of decades they made good profits. Not out of cheapskates like me though. 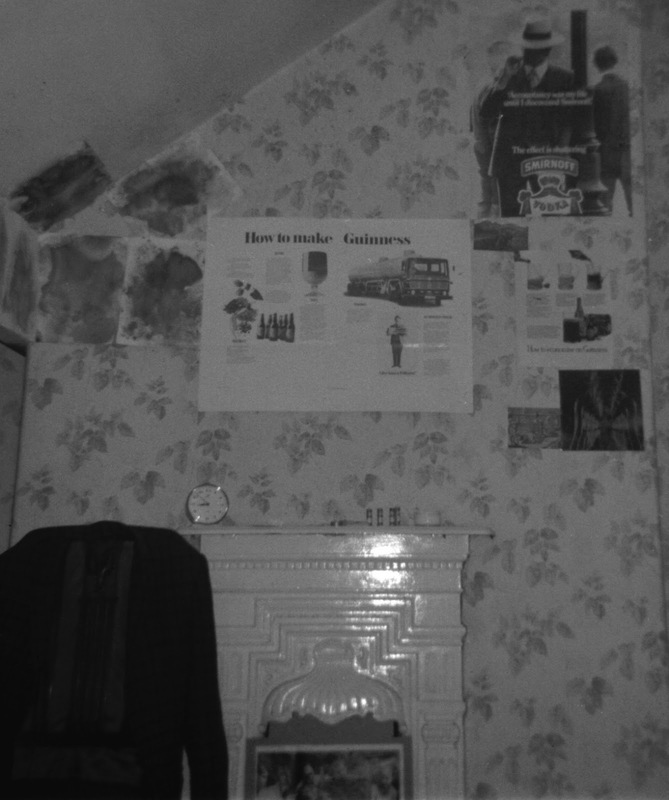 My walls were adorned with a scruffy and eclectic mix of images acquired entirely free of charge. Here are some of them in my attic bedroom in our dingy shared house in Leeds in 1972, next to some colourful ink blots on blotting paper, the product of an idle, unsupervised afternoon at work. One was a Guinness poster to show that independence and resilience were important parts of my individuality. You had to be pretty independent and resilient to drink the stuff. No one else I knew liked its burnt and heavy flavour. I’m not even sure that I did. I had sent Guinness a sycophantic letter admiring one of their newspaper adverts: ‘How to Make Guinness’. Back came a roughly A2-sized poster in a cardboard tube. * It caricatured the process from harvesting the barley through to delivery by road tanker, and gave sound advice on how to avoid common errors such as brewing it upside down with the head underneath the body. 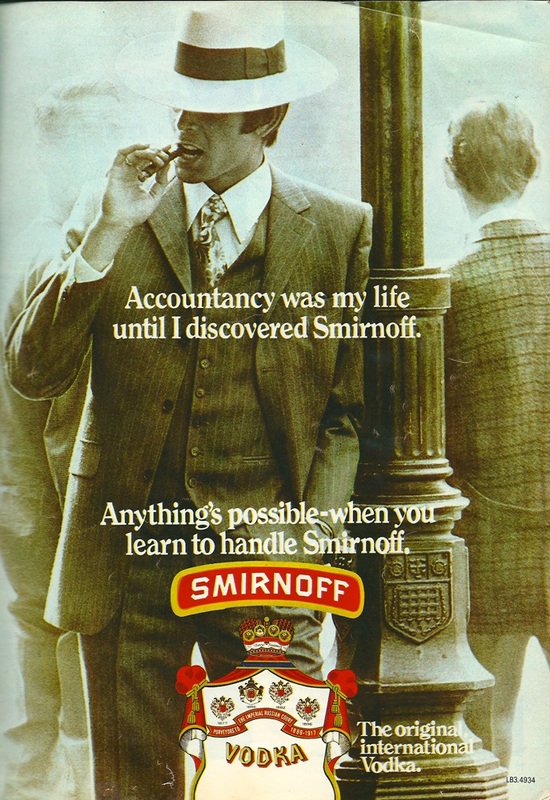 Then there was the Smirnoff poster: “Accountancy was my life until I discovered Smirnoff.” Well, it was true, accountancy was my life, and I dearly wished it wasn’t. Oh that something so simple as learning to handle a bottle of vodka could instantaneously transform it from the humdrum into one of glamour and excitement! But, from the other adverts in the series, I would rather have been the camel train trekker who used to take the caravan to Southend but now traversed the desert, or the mainstay of the Public Library who had escaped to carefree rural reverie, rather than the suited, cigar-smoking, nineteen-thirties City of Westminster gangster in the wide-brimmed Panama hat. Anyone would have thought that accountancy was boring. Well, thanks to John Cleese and Monty Python, that is exactly what most of my contemporaries did think. Most damaging was the ‘Vocational Guidance Counsellor’ sketch about an insignificant little man whose careers advisor declared without doubt that the ideal job for him was chartered accountancy. “But I am a chartered accountant,” he protested. He wanted a new job, “something exciting that will let me live.” He wanted to be a lion tamer. Chartered accountancy was “dull, dull, dull ...”, a career in which it was a positive advantage to be “unimaginative, timid, lacking in initiative, spineless, easily dominated, no sense of humour, tedious company and irrepressibly drab.” The sketch ends by asking for donations to The League for Fighting Chartered Accountancy: “this terrible debilitating social disease.” I am certain it influenced my subsequent rejection of the career. So much for independence and resilience. The senior partner where I worked found the sketch so offensive it became practically a dismissable offence to admit you watched the programme. 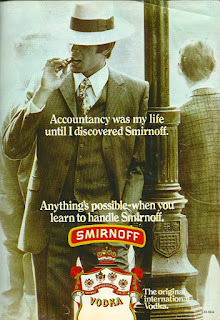 John Cleese, however, discovered that his own accountant was not offended in any way at all. When asked why, he explained it was because the sketch was about chartered accountancy, whereas he himself was a certified accountant. But a fervent Monty Python fan I was, one of those who could recite ‘The Piranha Brothers’ and ‘Room for an Argument’ off by heart. 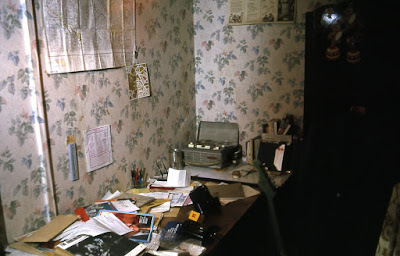 We even used to audio-tape and transcribe the television shows so we could act them out ourselves in our shared house. My brother used the school's photographic equipment to make a poster from the Whizzo Quality Assortment page of Monty Python’s Big Red Book. This showed a box of chocolates containing such delights as Crunchy Frog, made using only the finest baby frogs, dew picked and flown from Iraq. “Do you take the bones out?” “No, it wouldn’t be crunchy if we did.” That poster went on my wall too. The programme for the show was in the form of a huge poster. Many of them ended up gliding gracefully across the vast auditorium in the form of paper aeroplanes, but with my bare walls in mind, I carefully rolled mine up and took it home. Here it is, well just the lower edge of it, at the other end of my attic room above a messy desk of reel-to-reel tapes, guitar music and the camera case. I still have it today in the Guinness cardboard tube, much faded, its corners damaged by drawing-pins and blue-tack. All serious offers considered! * With it came a smaller poster, ‘How to economise on Guinness’, which suggests mixing it half and half with champagne to make ‘black velvet’. This can be seen to the right of the ‘How to make Guinness’ poster. Ah, I'm jealous beyond measure that you saw Monty Python in the flesh! That programme was a bargain at 10p. This reminded me of my student bedroom - it might have been 20 years later but things hadn't changed much, I had the Jimi Hendrix and the Salvador Dali posters just the same. Sadly, I threw out the Guinness and Smirnoff posters only three or four years ago, never imagining they might be useful for such as here. I now can't find an image of the 'How to Make Guinness' advert anywhere. The moral: keep everything; don't declutter; throw nothing away. At least I kept the MPFC. I probably went outside the time frame in the list of posters in the first paragraph, so some may not have been published until much later. Also,an extension to the moral: if you do have to throw anything away, digitise it first. Are they still used to make paper aeroplanes?